My computer has been falling apart recently, including issues with Firefox that made moderating the forum nearly impossible, so I switched to Opera for forum stuff until I can find enough time to fix my computer issues. Definitely not as good of a browser as Firefox, missing a lot of features that I came to rely on, but it will do for now. I found this image on Wikipedia. Haha I couldn't find a country that used Safari at all. ...didn't you see all that blue? Its not distressing. It just means lots of people still use IE. Heck, I'm using IE10 to type this on WP8 on my HTC 8x. 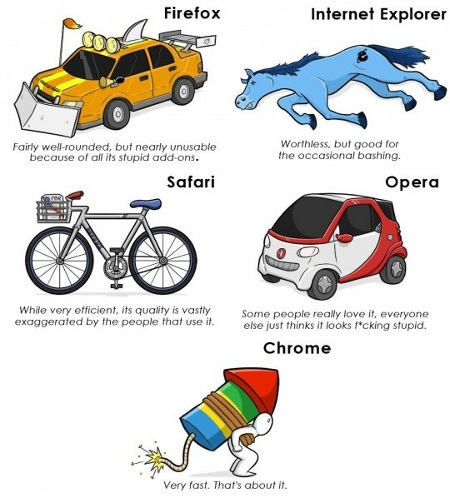 As for PC browsers, will a chrome user explain why I should switch to google chrome? One reason I like firefox is because I can customize the layout and size of buttons. Usually I'm working with a 1080p monitor and buttons with images and text work better for me. Well, I do still believe it's the fastest one and the most smooth looking. And I don't quite agree with this, but I love it anyway. Chrome for spped and efficiency. I like its minimalist approach. Sorry HarbingerDawn, but I do subscribe to the view that IE IS the best browser for downloading another browser. I still want to know how a browser that spawns a dozen different processes when you run it can be considered superlative. Also, a browser's "speed" is irrelevant to me, since my internet is so slow that even a slow browser could do whatever it needed to in the time it takes for content to load. And I have 16 GB of RAM, so if something wants to be a memory hog it is welcome to. I care more about what a browser can do, not how quickly or efficiently it can do it. I use Chrome for everyday browsing, because it is fast, minimalist and the few plugins I have (Awesome Screenshot, Awesome New Tab Page, GMail Notifier) are great and does ONLY what you want them to do. Else I use Firefox for webdesign because of IE7 to 9 emulation and several webdesign plugins that helps me alot. PS: Yep, I emulate IE on Firefox because last time I opened it (by accident) it made a Blue Screen. Most of my computer problems seemed to have solved themselves magically (reboots ftw, shows how little downtime my comp gets) so I am gladly ditching Opera and resuming forum work with Firefox! This is going to make me sound like a stupid hypocrite, but I switched to Chrome. What spurred this were some problems I was having with firefox while using Blogger- I finally got tired of it, and decided to give chrome another try. Firefox usually works fine, but Chrome is noticeably faster (as everyone knows), and I figured that being able to sync everything is a nice perk. No more worrying about re-bookmarking things (I have a couple of computers in different places I use on different occasions). Then I figured I might as well switch to chrome. There were some customization options for the toolbars that firefox has but Chrome lacks, but I figured that the benefits of switching outweighed the drawbacks. I was able to transfer saved bookmarks and passwords in an instant. The last time I switched my web browser was years ago, right around when Firefox started to become popular. I can't even remember how I found out about it, but I liked it better than IE and had been using it ever since, except for when I became really enthusiastic about Apple computers, and I would often be found using Safari. Once I switched back to Windows, I used Firefox again. (Apple really doesn't care about how well their software runs on Windows computers. I think they want the average joe to assume the problem is their computer, and not the fact that Apple doesn't care if their windows apps have slow, bloated interfaces.) Before Firefox, I would use Internet Explorer and AOL (I had an AOL account, which I no longer have; it was my first ever email address). So, now I'm using Chrome, I guess. Firefox since it first came out. I've been using IE in the last year to upload pics and quick browsing like checking the news as an alternative to opening firefox many saved tabs on my newer gaming rig but quite a few sites don't support IE fully now. I wonder how it's still surviving. It's always been crap but years ago if firefox/opera didn't work on the occasional site you'd have to open IE, now I'm struggling to use IE for brief browsing due to sites geared towards google chrome or code changes that effect save passwords, editing posts or other features not recongized y IE. Flickr has issues and vimeo are quite honest that they don't support it properly and tell you to use a modern one. When I installed chrome I didn't like the clean interface as everything seems tucked away within menus and sub menus, I want everything there, with all my handy plugins. Also didn't like how it installed everywhere on my OS. I hear you can customize it but I just wanted it off my pc and couldn't be bothered making all the changes. I can see why its popular, at least my country are using something better than IE according to the graph. We get a lot of IE adverts here lately, I have to wince really, can't believe MS has the cheek to even proclaim it with funky google chrome style ads, being such a draconian piece of software. I started with Mosaic and switched to Netscape when that came out. Then to Opera in the late 90's, but a few years ago I switched to Firefox (which originates in Netscape). I've all the time occasionally used lynx. I've also use Amaya at times, but not in the past 15 years. Firefox is an ugly beast, but seems pretty stable now. A gestures plugin (as in Opera) is an absoulte must for me.